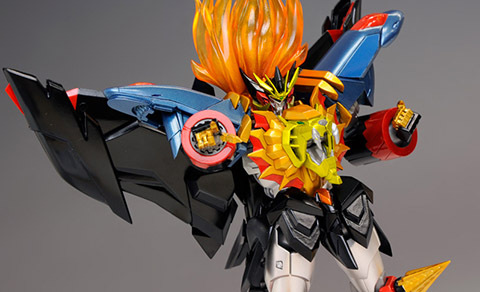 Over at AmiAmi they have a really lovely preview of the forthcoming Super Robot Chogokin Genesic Gaogaigar toy slated to come out in March of next year. Price-wise it looks like it will be in the same range as the other toys from this line, a considerable reduction compared to the Max Gohkin toy released a few years back. Admittedly this will be a smaller figure but the sculpt and accessories are arguably as good if not better. We’re also pretty sure this won’t be a webshop exclusive either. For those unaware, the original Gaogaigar was designed by none other than Kunio Okawara but the later Genesic version was handled by Kazumi Fujita, an interesting parallel to that of the original Gundam designs and their Zeta counterparts. Anyway, this is one of our favourite super robot mecha and to have it made more accessible is a lovely thing indeed.